The research project SEE-KID is carried out at the RISC Software GmbH, Research Unit for Medical-Informatics. RISC Software is a non-profit public funded research organisation owned by the RISC Institute (Research Institute for Symbolic Computation) of the University of Linz. SEE-KID provides a software system SEE++ which implements a biomechanical, interactive 3D simulation of the human eye and its muscles. 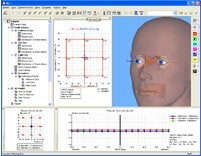 The SEE++ software can simulate common surgical eye muscle operations (transposition, shortening etc.) in a graphical interactive way that is familiar to an experienced surgeon. Additionally, the system is used for education and training purposes, because by means of extensive possibilities for parameterization of the human eye model, common pathological cases of human eye motility can be modeled – and subsequently treated. The software project SEE++ is the realization of a biomechanical model of the human eye and is partly based on ideas and concepts originally invented and implemented in the software system Orbit™ 1.8 by Joel Miller (Eidactics). This mainly mathematical description of the oculomotor system forms the basis for the proper predictions on simulation and treatment of pathological cases.